Sterile, 2-piece drape with circle aperture. Adhesive square around aperture area. For use in LASIK, refractive, corneal, and lid/plastic procedures. Overall size is 16" x 10.75". 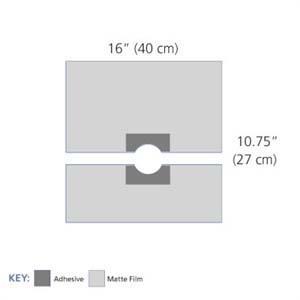 Aperture measures 1.5" x 0.98" and adhesive area is 3" x 3". Sold 10 per box.